Menu planning strategies are plentiful, but not many break things down into simple steps. I intend to break the mold on that. 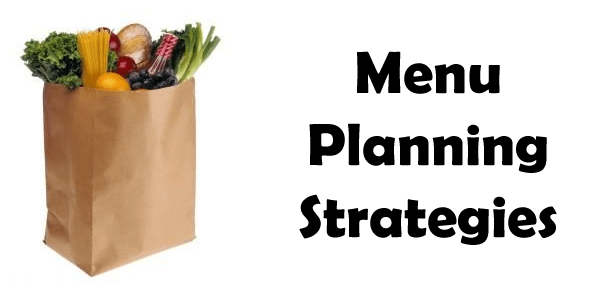 Whether you want to lose weight, lose fat or get into competition shape, menu planning strategies are what you need to accomplish your goals. Before I begin I want you to understand that menu planning isn't what you might think. In fact, I am going to explode the myths you've been holding on to. This is important because if is the key to all of your success with physique transformation. So many people have come to believe that menu planning involves counting calories. To an extent they are correct, but the key is that they don't seem to grasp the right way to count calories. Counting up the calories of your meals as you go along is not what I am referring to. I advocate planning your meals at least the day before and counting the calories and macronutrients as you do so. This makes the job easy because you don't have to track as you go along, you just have to stick to the menu planning you already did. I used to follow the “bro” mentality for eating. I would minimize the number of foods I could eat and stick to it. Now I follow a flexible diet. I can eat what I want and when I want as long as it fits my macros and my calories. I plan ahead each day for the next day's meals. I cook the food and pack it in containers that can travel easily. This takes away a lot of the problems I used to face. If I know that I am going to have lunch with my co-workers tomorrow, I plan all other meals accordingly. The goal is to hit my macros consistently. Again, like the calorie counting, I don't enter my food as I go, I simply enter my menu planning ahead of time into the app (My Macros+) and edit it during the day. If I miss a meal, I edit it out of the app. If I eat something unplanned I edit the app. In this way, tracking what I eat becomes easy. Nothing works overnight. You have to be consistent over the long haul. It takes time to see results, but the results are worth the wait. The steps for menu planning are quite easy. Decide on a methodology. Will it be “bro” eating or will it be flexible dieting? Whatever you choose, be prepared to stick with it for some time. Plan your menu at least one day in advance. Do more if you have time, but the bare minimum is 1 day in advance. Enter your plan into an app for tracking food consumption. Check the numbers and adjust your plan so that you meet your goals. Repeat steps 1 through 3 daily. By doing this type of menu planning you increase your likelihood of success greatly.